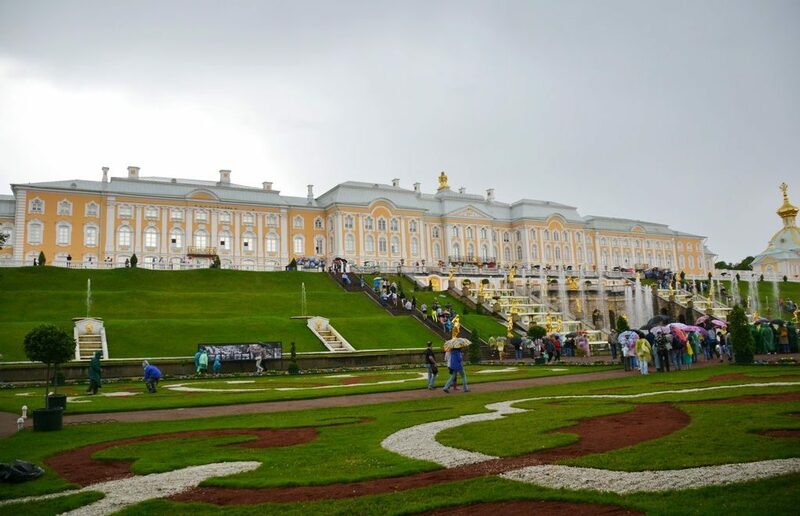 The Peterhof Grand Palace ticket prices for the high season 2019, which starts on April 27, have remained at the level of 2018. The Palace is located betweeen the Lower Garden and the Upper Garden with the entrance through the Lower Garden. It is mostly visited by tourists during the summer. What’s interesting, the museum is usually being ignored by many locals who prefer strolling through the Lower Park enjoying the fountains and other sightseeings. Some categories of foreign visitors have a right to free admission, for example, everybody under 16 of any nationality. With a hydrofoil trip to Peterhof and entrance fees to the Lower Park and a tour to the Palace, a visit to Peterhof will set you back more than 2,600 rubles. tickets offices are open till 19.45. The Palace is closed on the last Tuesday every month. Please note that the Palace is not open to individuals permanently, at some hours it is being closed for serving tourist groups, which are numerous in the summer season. In 2019, entrance for individuals is: 12.00 — 14.30 and 16.15 — 19.45. From April 27, 2019, every individual visits the museum only within a group. You buy a ticket and go at a certain hour in a group of the individuals. The museum tends to be overcrowded on weekends as well as the whole Peterhof complex itself.